Established in 1872 when the Northern Pacific crossed the Red River from Moorhead, Fargo quickly became an important town. The combination of the railroad and the wheat boom created a flourishing frontier city in the 1870s. The railroads brought goods into Fargo for sale, and established it as the area's major retail, wholesale, and service center. From 1880 to 1940 Fargo grew consistently with substantial immigration. Many of the early city leaders were Yankees from states such as Maine, Wisconsin, Minnesota, Iowa, and Illinois, as well as Canadians. European immigration before 1900 was predominantly from Scandinavia and Germany, but after 1900 it broadened to include other countries. These immigrants brought strong traditions with them that became evident in the religious and cultural life of the city. David Danbom and Claire Strom teach at North Dakota State University. 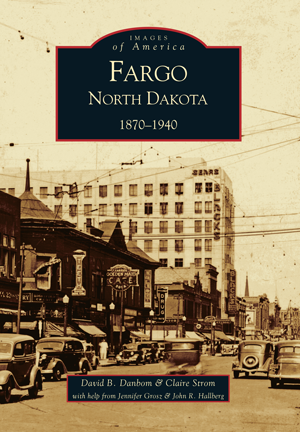 Danbom is a renowned historian of rural America who has done considerable work on the history of Fargo, including a book on the history of the North Dakota Agricultural Experiment Station. Strom's work has focused on the history of the Great Northern Railway. She is involved in public history, teaching a number of classes as well as serving on the board of the Cass County Historical Society.